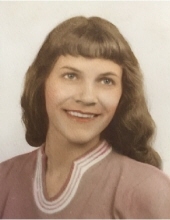 Gloral Mae Hurst Madden, 79, of Garrison, passed away Sunday, February 3, 2019, at Community Hospice Care Center in Ashland. She was born May 10, 1939, in Greenup County, a daughter of the late Raymond and Lacie McFarland Hurst. Gloral was a member of the South Shore Church Of Christ. She enjoyed gardening, working in her flowers, taking care of her dogs and spending time with her family. Gloral is survived by her husband of 60 years, Glenn Edward Madden; one son, Jamey Madden (Peggy) of Garrison; three daughters, Glynnis Bivens (Tommy) of Quincy, Nancy Shelton (Jay) of Lucasville, Ohio, and Vickie Turner (Steve) of Clarktown, Ohio; one brother, Ray Hurst of Nevada, Ohio; eight grandchildren; and five great-grandchildren. She also leaves many other family members and friends who will sadly miss her. In addition to her parents, she was preceded in death by one sister, Ven Gay Hurst. Services will be at 11:00 a.m. Thursday, February 7, 2019, at Globe Family Funeral Chapel in Garrison with Bro. Gary Vaughn officiating. Burial will follow in Granny Thomas Cemetery. Friends may visit from 6:00 p.m. until 8:00 p.m. Wednesday, February 6, 2019, and after 9:00 a.m. Thursday at Globe Family Funeral Chapel, 103 Dudley Avenue at Garrison. Gloral’s grandchildren, Nathan Madden, Roy Turner, Ryan Turner, Alan Shelton, Jarrod Bivens, Jacob Shelton, and Zander Bivens will serve as pallbearers. Emily Madden will serve as an honorary pallbearer.